Swoon Style and Home: Mamma Mia! I was planning on doing a What Would Jamie Wear since I have been window shopping like crazy after getting my computer back but while I sat on my couch this morning watching morning movies I came across Mamma Mia and had to stop and watch it for the eighth time. So instead of taking about clothes and what I would wear today I want to bring this film to you, especially for those of you who have not seen it. I am a sucker for a love story, I have seen Sweet Home Alabama about twenty times and I cannot promise I will not watch it another twenty, there are just some stories that never get old. 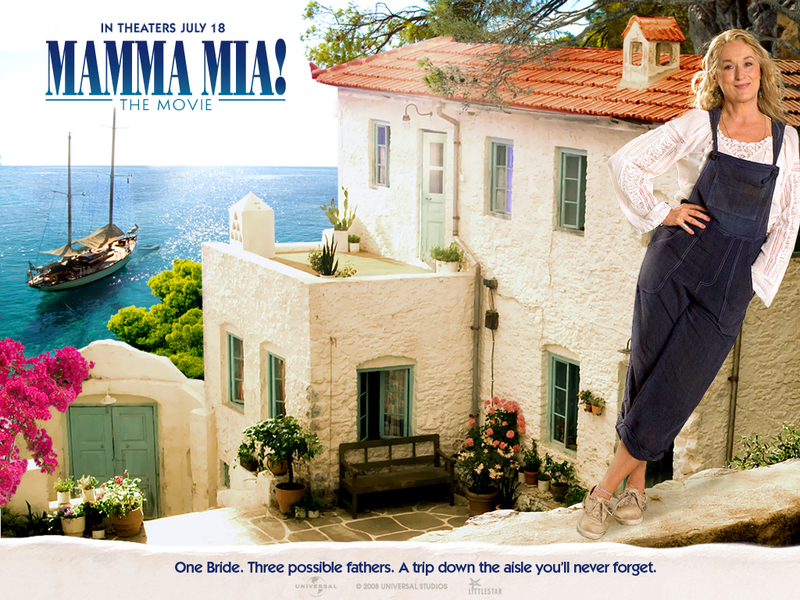 Mamma Mia is set on a beautiful island in Greece and is all about, love, young love and past loves, a wedding or two and some some that you all may recognize! There is a such a warm feeling you get when watching this movie and it is not just the beautiful sunshine and blue water surrounding the set, the relationship between Meryl Streep (mother) and Amanda Seyfried(daughter) is so touching it will make you all want to call your mothers. Before I go, I will mention one of my own guilty pleasures which is looking at Amanda Seyfired's wedding dress, yes a bit different but so pretty(I swear I will never stop shopping for wedding dresses!). Now, ready set, go watch this film and let me know what you think!